Governor Jim Hunt has been a Member of the law firm of Womble Carlyle Sandridge & Rice, PLLC since 2001 after completing the last of his four historic terms as Governor of North Carolina (1977-1985, 1993-2001). Nationally recognized for leading his state through two decades of dramatic economic change and educational reform, Governor Hunt spearheaded the transformation of its economy from traditional industry to knowledge-driven industries – biotechnology, pharmaceuticals and IT. Among his many successes in education, his early childhood education program, Smart Start, has been a model for the nation and has received the prestigious Innovations in American Government Award from the Ford Foundation and the John F. Kennedy School of Government at Harvard. In the last decade of his governorship the schools of North Carolina increased NAEP scores more than any other state in America. In the 1980’s, Governor Hunt and the Carnegie Corporation of New York created the National Board for Professional Teaching Standards which he chaired for ten years. Under Governor Hunt’s leadership, North Carolina consistently ranked at the top of the nation in economic growth, job creation and capital investment, and was nationally recognized for its business climate. Ever mindful that establishing the future economic prowess of his state depended on the “new economy,” he established the North Carolina Biotechnology Center, the Microelectronics Center of North Carolina, and the North Carolina School of Science and Mathematics. The state quickly became known as the most innovative state in the nation in biotechnology and IT. Uniquely qualified, Governor Hunt continues his promotion of North Carolina as a business friendly destination. Having been instrumental in decisions to move companies to the state, he knows first-hand what moving a global company to North Carolina entails and the benefits it confers. In addition, Governor Hunt continues to collaborate with governors across the U.S. as part of the “State Leaders for the Life Sciences” initiative he founded in 2008. He joined Governor Luther Hodges in 2007 as the only governors in state history to be inducted into the North Carolina Business Hall of Fame. 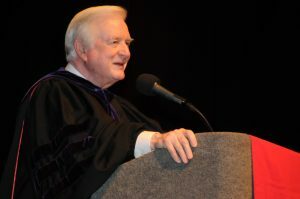 In 2006, Governor Hunt was named one of the ten most influential people in American education, along with Microsoft Chairman Bill Gates and former Presidents George Bush and Bill Clinton. Governor Hunt earned his BS and MS from North Carolina State University and his JD from the University of North Carolina School of Law. He was admitted to the North Carolina Bar in 1966.